Under religious execution Tirumala, Tirupati, Tiruchanur formulate into a divine unit with approachability to lakhs of devotees as a holy grid of temples. In and around these blissful places of worship are there number of other temples serving devout visitors and faithful followers. Sri Venkateswara Swami temple on Tirumala hills, Sri Govindaraja Swami temple at Tirupati, Sri Alamel Manga temple at Tiruchanur are the chief triple temples of this sacred area. Sri Kalyana Venkateswara Swami temple at Srinivasa Mangapuram, Sri Kapileswara Swami temple in Alipiri locus and Sri Kodandaramalayam in the town are three more important and busy temples annexed to T.T. Devasthanams. There are modest temples in side all the capital temples and within the compound walls of the temples. There are some more lively temples connected to the temple city of Tirupati. And all such temples have due and respective description and details bestowed in this book, in addition to the legendary account and architectural construction of the main temples. Dr. M. Rama Rao who authored this publication of T.T.D. in 1963, having proficiency in the faculty of History, had gathered historical, ephigraphical and inscriptional evidences about the establishment, maintenance, support and practices of all the chief temples in Tirupati region. The findings are aligned in a befitting, brief and appropriate sequence to make this book a handsome one. To put it in nutshell, this is a worthy book to be taken as a guide to view the background and growth of temple culture developed around Vengadam, otherwise known as Venkatachalam and its surroundings down below the hill. 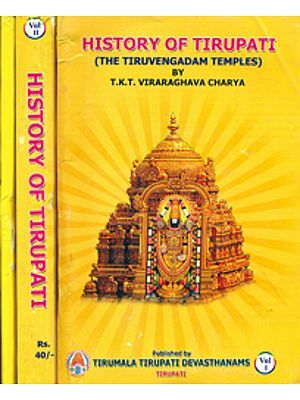 No explanation is needed for the writing of this small book after the publication of two books, of two volumes each, entitled HISTORY OF TIRUPATI. 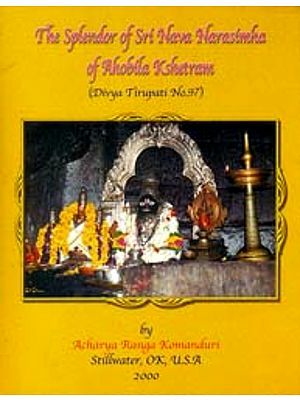 Dr. S. Krishnaswami Aiyyangar's pioneer work contains much of contemporary history and many inconclusive discussions. Sri T.T.K. Viraraghavacharya's book is really brilliant and contains many new facts stated boldly and with considerable authority. It includes, however, several sections relating to temples, agamas, modes of worship etc., in too much detail. 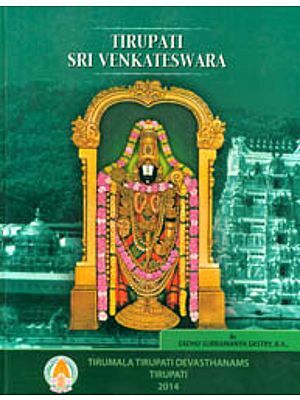 Further, neither of the two writers mentioned above have included in their books even a brief description of the temples in and round Tirupati. Hence this third attempt. This account of the temples of Tirumala, Tirupati and Tiruchanur is based mostly upon the inscriptions found in the temples in these places. The Puranic sources have also been utilised wherever helpful. The history of each temple has been traced with the aid of the inscriptions that it contains and all important monuments have been described with particular emphasis on their architectural features and artistic contents. The Parasaresvara temple of Jogi-Mallavaram, which was for a long time part of the bigger village of Tiruchanur, has been described here fully. The same is the case with the Kapileswara temple, Tirupati. It is hoped that this small book gives the general reader a fairly good idea of the temple and their importance and helps him in studying their architecture. I am thankful to Sri C. Anna Rao, Executive Officer, T.T. Devasthanams, for kindly suggesting to me the desirability of writing a book of this kind and arranging for its publication. My thanks are also due to Sri. P. U. Subrahmanyam, Superintendent, T. T.D. Press for evincing keen interest in the printing of this book.